Speed, Classic B Team Race. Classic B club racing was scheduled at CLAMF on Sunday, 19th May. 2013. Weather could best be described as inclement with frequent early showers sweeping across the pristine flying field. The anticipated conditions probably stopped a few extra competitors from arriving, including Gavan Opperman who was put off coming down by severe wind and rain squalls at his house for most of the morning. If Gavan had made it to the field, his yellow B25R Rocket would have been right in the mix as it recorded a 3.11 in its last race, faster than the winning time today. Oh well… there’s always next time. Such is life! However, patience as they say, is a virtue. As we hoped, the weather cleared early afternoon and provided near perfect flying conditions. Classic B was run on the verdant and closely mown grass circle adjacent the clubhouse. With just four teams at the field, it was decided to run two up heats with each team having two races. First up was Harry Bailey and Peter Roberts vs John Hallowell and Andrew Nugent. The race was tight with Harry’s Brodak Galaxie taking the challenge right up to John’s OS FX Streak. Smart work in the pits by Andrew and Peter ensured a close race with the Streak crossing the line first in 3.13.35 with the small winning margin of just 2.65 seconds. The red and blue Streak was being raced for the first time. It was built especially for the late and great Lance Smith before his untimely passing. 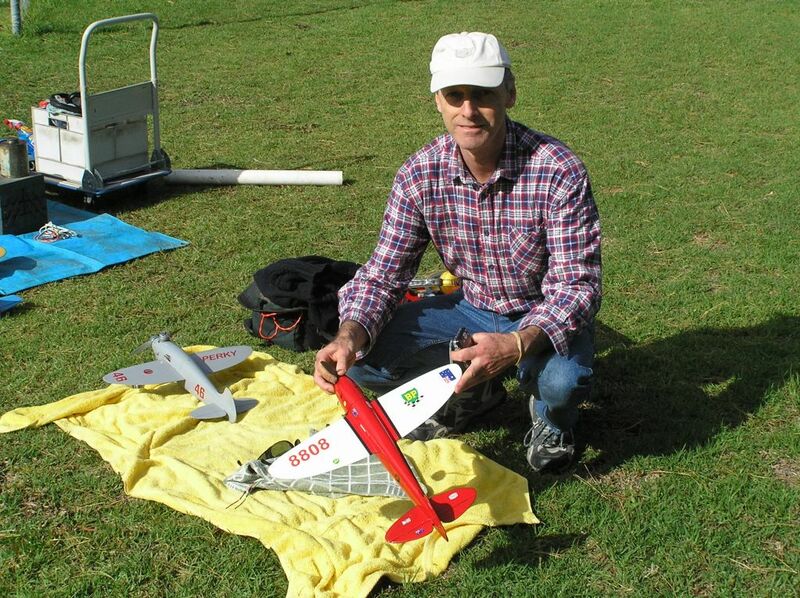 This model was displayed during Lance’s funeral service to reflect his passion for racing model aircraft. Andrew and I were both very proud to fly it. Next heat was Graeme Wilson and Paul Stein vs Ken Hunting and Mark Ellins. Paul was expecting big things from his Irvine 25 Rocket, having recently swapped engines. The Irvine replaces his much revered and record breaking Alan Barnes Enya. It was up against Ken’s own design GMS 25 racer, capably flicked by the World Champ himself, Mark Ellins. They crossed the line first in 3.25.07. It was disappointment for Graeme and Paul. They were away first and had superior airspeed. As usual, Graeme nailed the landing, Paul took his regular fast catch, but the Irvine refused to fire up. It had lunched on the cold Rossi no.4 and a 47 DNF was entered beside their names. On their second heat, Ken and Mark were a few seconds slower on 3.33.16. Graeme and Paul had another brilliant start but again were unable to finish as the Irvine crunched another new plug, despite a richer needle setting. Paul was getting plenty of advice about head clearances and nitro content and I’m sure he will take it all on board… and there is nothing surer… with the next main race coming up in Albury in a few weeks time, this issue will be well and truly sorted by then. Bank on it! Andrew with his Super Tigre G20D powered Perky racer.